Sometimes I get carried away with combining ingredients when I should just keep it simple. After reading in Saveur about roasting radishes, I ran right out and bought some. And then I thought, why not roast some pearl onions and garlic along with them? If I’d stopped right there, I probably would have been more satisfied with the results, but instead I had to think, “How can I make this heartier?” and then answer myself with the word “quinoa.” Thus, a less than perfect dish was born. To be fair, my husband loved this. E and I each had a serving and didn’t not like it but weren’t crowding around the pot for seconds, either. As I type this, I’m eating bites of the leftovers between sentences, and there’s really nothing wrong with it, but it just doesn’t inspire me to poetry. I think because I love quinoa, roasted garlic, roasted onions, and, I now know, roasted radishes, I just expected more. Still, don’t let my failure to achieve a deep emotional connection with this dish prevent you from trying the best new-to-me idea to come out of it: roasted radishes. When you roast radishes, they soften, become slightly sweet, and lose their spicy bite; I can imagine sprinkling them with seasonings and eating them as a snack–a healthy snack, since these root veggies contain only 64 calories per pound. And that’s no small potatoes! Serve this alongside a bean dish and salad or a vegetable, or turn it into a main dish by adding cooked beans or a little vegan sausage. Place the onions in a bowl and cover them with boiling water. Allow them to sit for 5 minutes; drain. Slice off the tops and peel. Peel off the very outermost layers of the garlic. Use a sharp knife to cut about 1/2-inch off the top of the bulb, exposing the tops of the cloves. Wrap in aluminum foil, and place it in a corner of the baking pan. Put the pan in the oven and roast, stirring every 10 minutes, until a fork easily pierces a radish, about 30 minutes. Remove the garlic and set aside to cool. 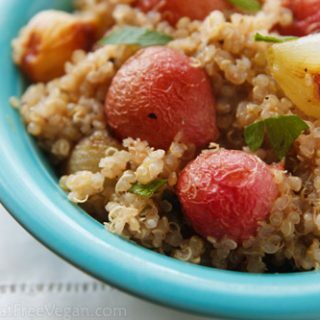 Toss radishes and onions with 1 teaspoon of vinegar and set aside until quinoa is done. While the vegetables are roasting, rinse the quinoa well. Place it in a medium-sized sauce pan and add the vegetable broth, oregano, and freshly ground pepper to taste. If you like, chop a handful or two of the radish greens (well washed) and add them to the pan. Bring to a boil, cover tightly, and reduce to a simmer. Cook until all water is absorbed, about 20 minutes. When both quinoa and vegetables are done, add the vegetables to the quinoa. Squeeze as many as you like of the cloves from the garlic and mash them lightly. Add the garlic to the quinoa along with salt, pepper, and additional vinegar to taste. Serve warm, garnished with chopped parsley. What a great idea! I've never even thought about roasting radishes, probably because I don't really like them raw, but I have to try this! Isn't it great that after being vegan for so long the things we can do with food can still surprise and excite you? I have often been stumped by what to do with the radishes we harvest from our garden. This sounds like such a good idea, as we really love roasted veggies. Thanks for sharing the idea! I'm eating the quinoa I just made while looking at this posting. D'oh! I should have looked online first! Bummer that this didn't come out how you wanted…it sounds so good! I wonder if something a little lighter like Israeli cous cous would work better than quinoa? I've never roasted radishes before. What a lovely idea. The dish looks yummy. I love radishes! I've never thought to roast them though. I'll have to try that out, along with another first, quinoa. But I have heard it's a great alternative to rice dishes. I'm not a giant fan of radishes, but this looks interesting enough to try. Especially since I have a bunch of pearl onions left over from another recipe and I was wondering what the heck to do with them! One question – Is it dried basil or oregano that's added to the quinoa? You listed basil in the ingredient list, but then in the directions it says oregano. Unless I'm misreading something. Thanks! Allison, good catch! Though either would probably work in this recipe, I used oregano. I'm off to fix the recipe now. I'm going to try roasting radishes the next chance I get! After reading this I was doing a little searching online and I also stumbled upon a recipe for Baked Radish Chips that looks pretty tasty too! Simply bake at 375 for 5-10 minutes per side after spritzing with cooking spray… can't wait to try them both! I'm never been much of radish-eater, but I do enjoy roasted veggies and quinoa. Like so many other people, I'm new to the world of roasted radishes, so trying them out will be a new cooking and tasting adventure for me! Yet another reason why I love your blog…your honesty! Even though it didn't bowl you over, it was a a great way of trying something new. Thanks for sharing! Side note, though: Susan, have you tried Job's Tears, sometimes (mistakenly) called Chinese barley? It is AWESOME – a big, chewy, tasty, grain-like seed that has 22 grams of protein per 2 oz dry. Twenty two! Anyway, to end the informercial here, I think it could be a good alternative to quinoa in this recipe. It would let the vegetables stay more separate and distinct and really hold its own, I think. When I tried roasted radishes I was completely struck by how different the roasted ones were from raw radishes. Loved them! Beautiful photos in this post, your photos are always so amazing! I never thought to roast radishes. Thanks for the inspiration! This looks so delicious. Thank you for yet another amazing recipe!! Oh my, I had never considered roasting radishes! I love the little things, and love roasted veggies – hurrah, I"m so excited about this! Thank you! Yum! I've never thought of roasting radishes! Sorry it didn't turn out to be a poetry-evoking meal, but I appreciate your honest posts, Susan! This looks DELICIOUS. Thanks for posting it! I recently discovered roasted radishes too! I love them! I could eat quinoa any which way, but this sounds like a great way! Thanks as always, Susan. Thanks for the creative recipe incorporating quinoa. I was introduced to it by my sister around Thanksgiving, but it's typically too bland for me…..definitely going to try out this recipe. Being a follower of the McDougall program, what can I substitute for oil when roasting vegetables? we need more of your kind of websites focusing on nutritional foods. I liked most of your soups and salads. Recipe looks great. I’ve never tried radishes, but I’m always up for introducing new produce in my routine! FYI, Weight Watchers has improved their program, and Points values are no longer relevant. Only PointsPlus values are applicable to current Weight Watchers. I would be best to post current information, or omit that portion of the nutrition calculations. Denise, on current recipes I’m noting that these are not the PointsPlus values, but it would be practically impossible to go back and change old posts like this. Made this awesome recipe today with a bunch of radishes from my first CSA delivery. I used green onions instead of pearl onions and added the green parts to the red quinoa after it had cooked with the veg broth and oregano. I doubled the red vinegar; i added a splash or two before serving. 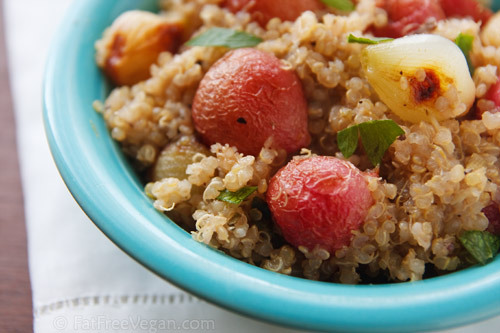 My husband normally hates quinoa but he loved this one…thank you! !